I woke up this morning in a bad mood. I happened to bump in to Avi Abelow and I told him that Israel should completely evacuate Sderot, and no soldier should go into Aza to die in vain. Olmert and Barak have made it clear that if Israel goes in, it is for “regime change” - handing over Gaza to Abbas and the PA terrorists. Abbas has made it clear that once he has enough strength he will attack Israel. While Livni pooh-poohs those statements as “for internal consumption only”, I am hard pressed to accept that when it comes to examining historically whom the Arabs lie to with statements like these, it has consistently been to Israel and the West, not to their own people. Furthermore, if Olmert and crew pooh-pooh’s Abbas’s statement of his planned destruction of Israel, we might as well ignore Iran’s as pure posturing. The whole reason terrorism in Judea and Samaria is unable to rise above a certain level is not because of Abbas and the PA (who are active participants in the terror), but because the IDF and the settlements are there controlling the territory. The second the IDF pulls out, either Hamas takes over and starts shooting missiles, or the PA starts shooting missiles because it will finally be in a position of strength. But my point was this. If the whole mission into Gaza is not to win, completely destroy the terrorist infrastructure and stay there, then our soldiers will go in and die in vain. In fact, the war with Hizbollah will start within 24 hours of our joining the war in Gaza as active participants, and Olmert still isn’t prepared to call our current situation a war, so he will continue to make the same mistakes as in Lebanon, with even worse results. Avi surprised me and told me I was looking at it all wrong. First he mentioned that he gets called up by the Army every 6 weeks for a meeting. They are begging him to come back to his unit. The officers he talks with at these meetings even “hypothetically” admit he was right that they were being sent to pointlessly die and not win, but they want him back. They claim the entire battalion is in a state of “anarchy” because every soldier there knows that Avi was correct. Avi’s return would indicate that things are now right and the government won’t be sending them to die in vain. They are afraid that the soldiers won’t go and die to keep Olmert in office and keep the terrorists in power. They may be right. They even “hypothetically” agree (as they can’t agree officially), but keep begging him to return to fix the situation by his mere presence. (Whether you agree with him or not, that by the way is the power of one man with principles, and that could be any of us, if we are willing to take a stand). Anyway, Avi said I was looking at this all wrong. The soldiers should go into Gaza, and they should make it clear that they aren’t leaving. True, there are practical issues here such as how to implement this realistically, but that is something that the government will be forced to work out if the soldiers do this. The soldiers should make it clear they are there to stay and do the job right. In fact, officially, the army’s ideal plan at the moment is to return to their strategic positions in Gaza before the Expulsion (the government doesn’t like that ideal plan) as that is the best way they feel they can prevent the terrorism short of expelling the local population. At this point, it is now up to the people. If the people reject Dichter, Barak, and Olmert and say you were obviously wrong with the disengagement, you are obviously wrong about Abbas, and you are obviously wrong about how to defend Israel, and we demand the job be done right… quite possibly we can make this happen. Well, yet again Rockets hit Ashkelon. This time they hit a house and 17 people were injured. The rocket was a Grad-model Katyusha. It has a maximum range of 25 kilometers. There is an article today that the Defense Ministry is worried that the Kassam missiles will have an effective range of 20 kilometers by next year. Um, fellows, wake up. They also have plenty of Katyushas too. Now you might ask yourself, 17 people hurt in Ashkelon from the rocket. Why didn’t they rush into their shelters when they heard the rockets were on the way? Well, the citizens didn’t know. You see, the mayor and city council decided, as policy, to not activate the alarm system for the rockets. There are plenty of rockets launched towards Ashkelon every week and most miss the population centers, so even as their aim gets better, why worry the good citizens when yet another one is shot their way? Got that, we shouldn’t go in to dismantle the terrorist infrastructure (that is a direct result of our leaving Gaza), because it will take years to dismantle it. Note he didn’t say we couldn’t dismantle it, he just thinks that that it would take too much time, I guess its better we continue to be punching bags, or is that body bags. PA President Mahmoud Abbas on Thursday said that he does not rule out returning to the path of armed "resistance" against Israel and took pride in the fact that he had been the first to fire on Israel and that his organization had trained Hizbullah. In an interview with the Jordanian daily al-Dustur, Abbas said that he was opposed to an armed struggle against Israel - for the time being. "At this present juncture, I am opposed to the armed struggle because we can't succeed in it, but maybe in the future things will be different," he said. The PA president also expressed pride both in himself and his organization, Fatah, for trailblazing the path of resistance. "I had the honor of firing the first shot in 1965 and of being the one who taught resistance to many in the region and around the world; what it's like; when it is effective and when it isn't effective; its uses, and what serious, authentic and influential resistance is," Abbas said. "It is common knowledge when and how resistance is detrimental and when it is well timed," he addad. "We (Fatah) had the honor of leading the resistance and we taught resistance to everyone, including Hizbullah, who trained in our military camps." Or maybe you can speak about your views as to the extent of Torah legitimacy conferred on the Israeli state. I have always seen them as little more than administrative apparatus and a logistic foundation for the beloved IDF. Religiously based or not, it appears to me that the Torah and more specifically the Halacha does confer legitimacy on an Israeli state. Certainly, in 10 years from now when the majority of Jews in the world are in Israel that answer will be even more definitive. Of course there are more serious issues that will need to be resolved once the majority of the world’s Jews reside in Israel. Many things that are non-obligatory or (possibly) d’Rabbanan now (such as Shmittah) will become d’Oraita. The position you are implying has serious ramifications and implications. Your question actually questions the legitimacy of the government of various kings from Malchut David who were not "frum". Would Menashe (for instance) not have been a legitimate King in your eyes, and his government nor a legitimate government? He may have been and done evil, but it would seem that Jews give legitimacy to the government they follow including a Malchut-based government (Power derives from the People). That a leader/ruler isn’t Torah observant, nor his ruling Torah-true doesn’t necessarily delegitimize his governmental structure (I am not saying that definitively, but it is something that needs to seriously be looked into). Of course there is no obligation, and more so, one is even forbidden to follow his anti-halachic rulings, for the most simple reason, that in Judaism, even the king isn’t above the law and therefore can’t make laws that abrogate the Torah. But the structure itself seems to have legitimacy derived from Torah and halacha. Give me a subject. If I like it I'll talk about it. Until now I wasn't really paying attention, nor was I even making an attempt at understanding the differences between the US candidates for president, but this YNET article has made it clear who WON'T get my vote. I'm trying out a new template. I hope you like it. I know, it doesn't look 100% right in Firefox. Get a real browswer that's actually compliant, people. Wow, this nearly slipped by under the radar. Most people probably forgot that Shimon Peres was caught accepting illegal contributions to his campaign. Very illegal contribution for very significant sums. Of course, he was never punished for it, but that goes without saying. Nor has he ever returned the money as he was supposed to do. Pere now has a new run-in with the very law he has complete disdain for. The President’s Office (not the President) is supposed to under go regular audits as part of the attempt to maintain the fiction of transparency in government ensuring that everything and everyone is kept Kosher. After all, like every other government office, the President’s office runs tenders, and hires contractors and employees, and like every other government institution it is supposed to undergo regular checks and oversights. Shimon Peres has decided to block that in the President’s office. His complaint is that there is bad blood between him and the government comptroller. His solution is that he will pick out and hire an external auditor to meet the compliance requirements! I can’t wait until one day someone manages to open up and publicize the records of the Peres Peace Center. Makor Rishon had an interesting article this Shabbat on Peace Now. They pointed out something new. Apparently (Supreme Court President) Dorit Beinisch when confronted by the illegality of Peace Now and its lack of court standing, decided to allow Peace Now to continue to petition the government (and allow its past petititions) while agreeing that it can't be sued, as for that it doesn't exist. Got that? They can sue but not be sued. It must be so cool to be above the law like that. At least 10,000 Jews from all over the country converged on Sderot today in a show of financial support by doing their Shabbat shopping in the town. I personally didn't go (I only found out about the plans a few minutes before everyone left - I've been out of the loop the past few days), though many from my town did go, and they told me they are having a great time. Instead I took my family on a quiet hiking tour of Judea and also stopped by the newly discovered gravesite of King Herod (which has finally been opened up to the public). (I'll try to add pictures on Sunday). Even if Israel goes into Gaza tonight to complete this war against Hamas, what's the point? To give control over to Fatah terrorists instead? That's not much of an "exit strategy". Quite to my surprise, I found myself shaking hands with Prof. Bernard Lewis at the Jerusalem Conference today. Looking back, I’m not sure he appreciated that he was shaking the hand of JoeSettler, probably because he didn’t know it was me at the time (nor was I planning on being there when I woke up this morning). Of course, as I am sure he must be a regular reader of this blog he’ll be slapping himself upside the head tonight when he reads this post before he goes to bed. Anyway, it was a veritable Who’s Who of right-wing intellectuals and Arutz-7 employees at the Regency (formerly the Hyatt) Hotel. Personally, I didn’t go in for the speeches. I found the conversations going on in the lobby to be much more interesting. That’s not to say that the speakers and subjects weren’t interesting (they definitely were), but I am far more amused by the semi-private round table discussion going on around the coffee pot than sitting in a room for an hour or two listening to same exact people give lectures. You've gotta love this guy Dror from the Winograd Committee. It's amazing he was able to keep his mouth shut for the entire process, because every time he opens his mouth now he just digs himself a bigger hole. Caroline Glick did an amazing analysis of Dror's previous comments. My favorite was when he pointed out that he felt he actually only wrote the report for 100 to 300 people who actually run the country and make all the decisions (who he considers his "clients"), of which maybe 10% are elected officials (which means he basically excluded nearly the entire Knesset). You gotta love his elitist attitude. His latest guffaw is that the country needs to be educated as to who to vote for. To quote him, the public "must be helped in their decision." There is currently a Price War going on. A serious one. While it looks like a good thing now for the consumer, ultimately it may mean that at least one supplier will be destroyed, while the others will be so bloodied that the only way for them to recover will be to raise prices far higher levels than before the price war. In reality, the best way to avoid being a victim of a price war (as a supplier) is to avoid it and continue to supply a better product, a better service, and better value. [That’s always been my philosophy when in the past my competitors, with their inferior products, have dropped their prices in an attempt to grab my market. True we would temporarily lose a client or two, but in the end, they always returned. True, for a short while customers will go where it’s cheaper, but in the long term, it’s better for the supplier and the consumer to avoid the war. Ignoring that advice, the large supermarkets in Talpiot have stupidly decided to try to wipe each other out. Years ago, Rami Levy was one of the first supermarket to seriously introduce “Predatory Pricing” into Jerusalem with his far below cost prices on Coca Cola. Coca Cola even sued him, and lost. And Rami Levy continues this successful practice until today. And Rami Levy grew and grew and became a successful and competitive (some might say unfairly competitive) chain. I guess he grew so big that the big chains are now reacting to him (actually they began reacting to him when they opened up new branches near his stores). So, this war began with chickens. Rami Levy already offered discounts on chickens (by a few shekels) if you made a big enough purchase (as did other chains). But then one of the other chains around the corner from Rami Levy started to offer chickens for a few shekels, so Rami Levy responded and reduced his prices, and so began the downward spiral. Rami Levy now offers chickens at around a shekel a kilo, while his big chain neighbors are giving them away for free. (I’m expecting them to pay us to take them away any time now). I heard someone comment, that these chickens didn’t go to the slaughterhouse expecting to be sold for a shekel. But the war hasn’t ended there. Now milk products have entered the fray. A container that used to cost around 7-8 shekels is now down to a shekel or 2 and dropping faster than the US dollar. No matter how big they are, there is a limit to how much these chains can afford to lose, and it is a serious question as to who will blink first – if at all. I needn’t mention what it is doing to the local butcher shops and small supermarkets. If one (or more) of the supermarkets collapses from this price war, then consumers in Israel (not just Jerusalem) will be in big trouble as one of the few truly free and competitive markets in Israel will be gone, and prices will immediately hit the sky. Why does this name strike terror into the hearts of Palestinian parents in the West Bank? There's a road in the West Bank called highway 55. Depending on your point of view, it's the road connecting Qalqilya to Shechem...or Kefar Sava to Eilon Moreh. In any event, it's a primary traffic artery in the Shomron. Highway 55 used to go through Arab cities and villages...Qalqilya, Nabi Alias, Azzoun, Jinsafut, Al Funduq, Jeet, Shechem...but because those places became rather inhospitable to Jewish vehicles, bypass roads were built and the road 55 of today is radically different than it was 15 years ago. While highway 55 doesn't go through Azzoun anymore, it still bypasses Azzoun to about 100 meters in certain places -- and that's when the trouble starts. Over the past few weeks, dozens of Jewish cars have been stoned and firebombed by Palestinian teenagers from Azzoun. In addition to smashed windshields, windows and bodywork dents -- Jewish drivers and passengers were hurt as well. Frustrated by the IDF's inability to keep this main highway safe and secure, settlers demonstrated on the road in front of Azzoun 2 weeks ago...yet it's only a matter of time before someone gets seriously hurt or killed (Ofra Moses was killed by a Palestinian firebomb on road 55 about 20 years ago). The settler retaliation is bound to happen as well. "We demand that the residents of Azun stop hurling stones and Molotov cocktails, and if you don't stop, we [the IDF] will enter the village, start firing at the residents and close down the businesses. This is our decision, and if you don’t stop the riots you will bear the responsibility," the leaflets read. They were signed by "Captain Joe". In the pamphlets, the residents were demanded to watch the village's children, who have a habit of throwing stones at IDF soldiers operating in the area. A day after the leaflets were hung up in the village, some of the residents of Azzoun said they were worried that this represented the true intention of the [IDF] soldiers. "Who will promise us tomorrow that there won't be crazy shooting at [Azzoun's] residents, because the soldiers can always claim there were rocks thrown at them," said a local Azzoun "activist." According to him [the unnamed activist], no one has complete control over the teenagers and "the soldiers aren't angels, and most of them antagonize the [Azzoun] residents -- specifically children." Another [unnamed resident] added that from now on the parents will be scared from sending their children to school: "I am worried the army will carry out their threat. If they catch someone, then punish him and arrest him, but why punish innocents?" I'm worried that soldiers want this to happen and will hurt the residents to teach the children a lesson. Children are children, and soldiers are supposed to be more responsible." So what do the Palestinians say? "Kids will be kids." It's only rocks and firebombs -- why are you getting all huffed up? And how dare you threaten us...we're simply peaceful parents. Driving past Azzoun almost daily, I can personally vouch that the IDF soldiers have no intention of going into Azzoun. They don't want to go in there...don't want to deal with the rock or firebomb throwers. They don't harass Palestinian children -- they are hardly ever in Azzoun to begin with! And yet..."Captain Joe" (now in big trouble with the IDF for his unauthorized leaflets) managed to scare some of the residents? The IDF is unable to keep the road safe, and yet "Captain Joe" has put fear into the hearts of the rock throwers? And their parents? West Bank settlers have had enough of the stones hurled at their cars. Dozens of Israeli vehicles arrived Sunday morning at the entrance to the village of Azun, east of Qalqilaya, in protest of the hurling of stone and Molotov cocktails at Israeli cars traveling in the West Bank. The organizers of the demonstration, which was authorized by the police, protested against the security forces' helplessness in their battle against the stone throwers. The demonstrators did not enter the village, but parked their cars at the roadside and made an appearance. Military forces secured the demonstration, which ended an hour later with no unusual incidents. The settlers told the assistant commander of the district's brigade that if the stone throwing continued, they would block the road every morning. Two Israelis were lightly injured Saturday by stones hurled at the car they were traveling in. One of the injured, a 15-year-old boy, managed to reach him home in the settlement of Karnei Shmoron and was evacuated from there to the Meir Hospital in Kfar Saba by a Magen David Adom crew. Another Israeli was lightly wounded on Friday after a Molotov cocktail hit his car. Following the stone throwing Saturday, Palestinians reported that a large IDF force had raided the village of Azun and searched its houses. According to the Palestinians, the officer who led the force into the village was none other than "Captain Joe", who had hung leaflets in the village about a week ago, threatening to fire at the residents if they continue throwing stones. Stones and firebombs being thrown at cars traveling 55 miles an hour down a road -- is attempted murder. Teenagers who routinely attempt murder and are encouraged by their parents, religious leaders, teachers and Palestinian Authority politicians and terrorists -- despite being teenagers are AT RISK OF GETTING SHOT. Get THAT through your heads. Kudos to Captain Joe, even though the IDF is giving him hell. I'm sick of responding to EMT calls for people injured by rocks and firebombs. If a leaflet will scare up the Azzoun residents, then so be it. "There is one other place in the world where apartheid is still [alive], which is in Palestine" Bishara said. Now I'm sure he didn’t mean to make that faux pas, but he is right. After all, let’s consider the state of Palestine. 2. If a resident sells land to Jews he will be executed (and this in enforced). 3. The Palestinian state is attempting to remove and destroy all Jewish and Christian vestiges (people and religious sites) from areas under its control. 4. Jews are not allowed to live in Palestine (Amira Hass being the notable exception, but I suspect her claim to Jewishness could be disputed). Those are 4 prime examples of how a Palestinian state is in actuality an apartheid state. "It [Palestine] is actually the biggest armed robbery in the history of the twentieth century." I certainly wouldn’t disagree with this second statement either. But I am amazed that he had the audacity to openly hint at the 5 aggressor Arab armies of '48, the 1929 Hebron massacre, and the Arab attempts to wipe out Israel in ’67 and ’73, all the suicide bombers, and Gaza in such a forum. This past Thursday, "Rabbi" Daniel Freedlander presented the numbers: Reform Jews care for Israel less than their brothers and sisters from other, more traditional branches. The numbers are based on this AJC study . I would love to see the raw data to do more in depth correlations, though I wouldn't expect any suprises. Certainly the correlation between caring less for Israel and the increased willingness to divide Jerusalem are obvious and expected. The Reform Chief Rabbi is worried that the right message isn't reaching his congregants (about caring for Israel). On the contrary, I think his congregants are correctly absorbing the exact message he is projecting at them. Treppenwitz thought that war was only a few days away a few days ago. Things are certainly heating up on both sides (and fronts). Certainly though, war will have to wait until after the snow. But it seems likely that war is possible. Anyone who visits the Gush during the winter months knows one thing for sure. The minute it drizzles the lights go out. For years the electric company hasn't fixed the electricity problem, so when it drizzles, you can see the lights flicker out like falling dominos across all the settlements - but usually not in the Arab villages next door, suprisingly enough. And when it snows, you can be without electricity, lights and heat for hours on end. The electric company's usual explanation? Oh, they no can longer clean the transformers. They used to do it by helicoptor, but since the Arabs tried shooting down the helicopter a few years ago they decided that cleaning the tranformers that way is too dangerous. In fact, sendng a ground-based cleaning crew to clean them is too dangerous too due to their location. So instead of finding an alternative solution after all these Oslo years of peace, they've let the wiring deteriorate. The tens of thousands of Gush residents have had enough. A Mr. Yechiel Fishman has organized a class action suit against the electric company. The electric company has responded so far like they always do, with a form letter that the electricity will be fixed soon (same letter every year, they just change the date). But now the ball is rolling. The public is mobilized. Hopefully change is in the air, money will change hands, and electricity will be delivered. Aryeh King opened a website not so long ago detailing the certainly questionable, possibly illegal, potentially illicit, and clearly immoral activities of Peace Now. He documents their questionable funding process. Their lack of legal status and standing. The police files opened against them for criminal activities. The foreign government using them to influence policy in Israel. Now it turns out Aryeh King is not alone. Perhaps as a result of the information published on his site the Israeli Justice Department began to fully investigate Peace Now. The Justice Department discovered that Peace Now was misappropriating, misusing and misdirecting funds as well as undertaking other illicit activities. The Justice Department discovered that Peace Now was does not even have proper documentation and certification. The implications are that Peace Now’s US tax-deductible status is highly questionable (which is perhaps the only reason that the Israeli Justice Department is possibly taking this seriously – because of the potential tax fraud that happened in the US). It is suggested that the Justice Department will demand that Peace Now be dismantled (with sensitivity of course). I hope that its leaders go to jail. The reality is that nothing will happen. Peace Now will be protected, just like Olmert and others. They will be given retroactive certification. At worst they will be told to return some money. No one will go to jail. Still, one can dream of a moral victory. Addendum: The Registrar of Non-Profit Organizations has revoked its certification of proper administration from Peace Now, after the organization was found to not have been administered or registered properly based on their actual activities (I believe the legal name for that is fraud). In fact, it seems that Peace Now has been trying to illegally create facts on the ground for a long time, and now expects their facts to recognized. Peace Now’s response to this is, “we have been operating for 30 years under these arrangements” – so now we know how long they have been committing this crime they have admitted to. A while back I wrote a post about Peki'in. It was after the police did the police thing and right after an interesting article in the JP about Druze-Jewish coexistence and the Jewish history of the village. (I can't find the post right now, but you can look yourselves it it really interests you). Anyway, yet again the local Druze residents torched another Jewish property in the village. I feel stupid for having believed the JP article, that there was a peaceful coexistence going on there. I apologize. I've espoused this position for a long time. Finally the residents of Israel and Sderot are shaking off their government induced aparthy, lethargy, and indifference. First of all they are expanding their protests - and I doubt they will stop it, no matter how many of their protesters the police arrest this time. But more importantly, they are talking about building and shooting their own rockets back at Gaza. If the High Court won't let the IDF take effective actions, and the government relies on the High Court to tie their hands to avoid taking the needed actions (one of their excuses at least), then they choose to take their defense and offense into their own hands. Here is the Facebook URL for you to join to show support. Hebron always has special interest for me. One of those reasons is that members of my extended family were owners there (from time immemorial) until the 1929 massacres. They still know where their homes are, even if they are currently inaccessable and under occupation. Ha'aretz is reporting that tribal leaders for the 2 largest Arab clans in Hebron met with Settler leaders from Hebron and Kiryat Arba (including Ketzeleh and Elyakim Haetzni) for the purpose of reconcilliation. It was reported that the meeting was conducted in a "positive atmosphere". 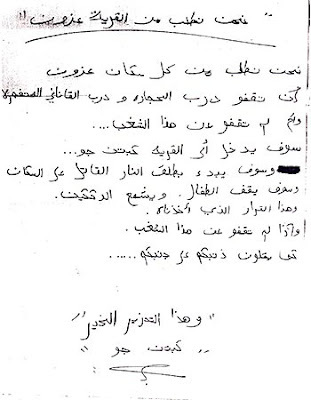 But as a result, the head of one the clans, Sheikh Ja'abri, received a death threat from Fatah's military wing (that would be the one controlled by Abbas the "Moderate"). If I hear more, I'll let you know. Beyond anything else, I think this short posting in the Jerusalem Post best exemplifies the unbelievable problem in Israel today. Israel will return the bodies of two Hamas terrorists who carried out the suicide bombing in Dimona last week to Hebron on Sunday afternoon, Israel Radio reported. Seventy-three-year-old Lyobov Razdolskya was killed and forty others were wounded in Monday's attack. While Hamas is holding one of our boys hostage and incommunicado, Israel is returning the bodies of a Hamas suicide bombers! Forget pride, where is the self-respect? When the Left and Right agree, something is wrong. The complete and utter lack of political repercussions and reverberations after the release of the Winograd report should have been a warning sign. Even now, even if the citizens are no longer 100% sure that the Prime Minister and his government didn’t act out of personal political expediencies, it is clear enough to the country that he and they certainly acted out of incompetence (or actually froze and didn’t act at all due to “indecision”, to use the terminology of the report). Yet the wording of the report was too weak to make a difference. For the most part the report didn’t name names (even if we all knew who it meant). In short, the report and the committee turned into a toothless tiger. But now we have the Tsunami. A senior member of the committee made remarks that seem to indicate a political preference in his part of the decision-making and content of the report. "If we think that the prime minister could further the peace process then that is a very worthy consideration. A peace process, if it is successful, will save so many lives that it is a weighty consideration." "We must think about the consequences. What do you prefer, a government with Olmert and Barak, or new elections that will put Netanyahu in power?" Astonishment and concern about the validity of the investigation and the conclusions of the report have been raised all across the political spectrum from Left to Right. Silvan Shalom, Ruby Rivlin, Limor Livnat, Zevulun Orlev, Yossi Beilin, and Shelly Yachimovich to name a few of politicians across the political spectrum all agree that something seriously wrong has happened in the committee and the report, and are all demanding an investigation of the committee, of what influenced its decisions, and perhaps even an entirely new enquiry. When such generally opposing voices agree on something, then further consideration is worthy consideration. Copied from the Machon Meir site. G-d promises Israel that Eretz Yisrael will be conquered little by little, as it says, "I will not drive them out in a single year lest the land become depopulated, and the wild animals become too many for you to contend with. I will drive the inhabitants out little by little" (Exodus 23:29-30). This process will continue until the Jewish People increase and fill the Land, as it says, "Until you increase and fully occupy the land" (ibid.). And what are the borders promised by G-d? " I will set your borders from the Red Sea to the Philistine Sea, from the desert to the river" (ibid., verse 31). Until we increase and occupy the entire land G-d severely prohibits us not to forge a covenant with the peoples dwelling in the land, as it says, "Do not make a treaty with [these nations] or with their gods" (ibid., verse 32). For if we do forge a covenant with them, it will be a "fatal trap" for us (verse 33). "We were commanded to occupy the Land which G-d gave to our ancestors, Abraham, Isaac and Jacob. We must not abandon it to any other nation, or to desolation… In the framework of this mitzvah, G-d gave us the precise details of the Land's borders… and we are not allowed to relinquish the Land to the nations in any generation. We were commanded to come to the Land and to conquer and settle it. This command to us to conquer and settle the Land applies in all generations" (see Ramban, remarks on Rambam's Sefer HaMitzvot, Mitzvah 4). Ramban's ruling is well-known, and it was accepted by all Halachic authorities, early and later sages (see Shulchan Aruch, Even HaEzer, Pit'chei Teshuva). Today, how fortunate we are that in our generation we are privileged to fulfill the words of the Written Torah and Ramban's ruling. In other words, we can move to Eretz Yisrael, conquer it and settle it. Through us is being fulfilled, "I will drive the inhabitants out little by little." When the Jewish State was established, the number of its Jews was 600,000, sixty myriad, like the number that left Egypt. The country's size was small. Abba Eban was right when he called Israel's old borders "the Auschwitz borders". Today, sixty years later, we are privileged to have about 5.5 million Jews living in our country, and each year that number increases by about 200,000, both from internal growth and from continuing Aliyah, sometimes in large streams and sometimes small. The size of our country is growing as well, and it will continue to do so, so that we will be able to absorb the millions of Jews on the way. Yet until then we mustn't forge any covenant or make any agreement with the Arabs, who are a "fatal trap" [Hebrew "mokesh", which also means "landmine"] that can explode and cause us heavy losses. As G-d commanded us, " Do not make a treaty with them… for it will be a "fatal trap" for us." The wretched, dangerous Oslo Accords unleashed upon us the intifadas and the recent wars, and we paid a heavy price involving many victims. Likewise, the "Roadmap", whose purpose was to establish for the Arabs a terror state in the very heart of the Land, constitutes an even more fatal trap than Oslo. We must find a way to neutralize these "minefields" and to dismantle them. The way to do this is through a return to Jewishness, to Jewish roots and to our holy Torah. We must foment a cultural, spiritual and religious change in Israeli society. Every Jew should learn and become familiar with the fact that Eretz Yisrael belongs exclusively to the Jewish People. The link between the People, Land and Torah of Israel will bring light and goodness not only to the Jewish People but to the whole world. By such means, all the world's inhabitants will come to realize that Hashem, the G-d of Israel is King, and his sovereignty is over all. Looking forward to complete salvation. Now that the nonsense of Winograd is over and Barak has ran away from his promise to leave the government, the JP is reporting that we are back to business as usual. Last week's attack on the high school was committed by 2 terrorists that Olmert had released just a week or two before. Now Ehud Olmert is having Haim Ramon work on proposals to expand the list of those Palestinians eligible for release, without changing “previously determined criteria”. The goal is to allow the release of terrorists linked to terrorist attacks but who didn’t actually and personally commit the terrorist attack themselves, leaving the work for others to do. I assume that would include certain terrorist leaders like… Barhgouti. What an interesting weekend its been (completely unconnected to Israel). As I know some of you completely rely on JoeSettler for your news, here are some other stories to broaden your horizons. Microsoft has put in a $44.6 Billion bid to acquire Yahoo in a bid to compete with Google. It turns out that 50% of the worlds online advertising gets placed on 20 sites (JoeSettler is unfortunately not one of them), and 18% of them are owned by Yahoo (I assume mostly Yahoo groups). In Finland, a girl had her jaw replaced with a replacement jaw that was grown out of her own stem cells and cultivated in her own body. That is major medical news. Is someone targeting the Internet or it just an anchor? Two major cables that connect India and Egypt with the rest of the Internet world were cut last week. This reduced India's internet capacity by 20% and caused severe disruptions in Egypt. And over the weekend it was discovered the the FLAG FALCON cable in the Persian Gulf connecting the USE and Oman was cut. Busy day in the Gush today. First thing in the morning, the Arabs threw an IED (Improvised Explosive Device) at a car driving on the highway near Efrat. When the army arrived the Arabs then exploded a roadside bomb near the army jeeps. No injuries to the good guys, B"H.
The highway was closed for a good part of the morning while the army searched for more hidden explosives. UPDATE (Feb 3): Highway was closed again today as a similar object was found. The second bomb on Friday was spiked with live bullet rounds.